Bill Brewster, MD, is the Medical Director and VP of Operations for the New Hampshire regional market of Harvard Pilgrim Health Care, a not-for-profit health services company. Dr. Brewster received his medical degree from George Washington University and is a practicing, board certified Internist. He has served as medical director for IPA Physicians Association of Rochester, Seacoast Redicare, and Well Sense, and on the board of directors for Citizens Health Initiative and Foundation for Healthy Communities. Dr. Brewster is a native of New Hampshire, where he dedicates his work to improving the quality of patient care across all modalities. Question: Let’s start with a little bit of history. How long has Harvard Pilgrim Health Care been around? Dr. Brewster: Harvard Pilgrim has been around nearly 50 years. It started in Massachusetts and has been in New Hampshire since the mid-1990s. We are a non-profit health services company and provide health insurance in Maine, New Hampshire, Massachusetts, and Connecticut. We are the second largest insurer in New Hampshire, and we have about 1.3 million members in New England, with another 1.4 million nationwide through our subsidiary Health Plans, Inc.
One thing that makes us unique is the Harvard Pilgrim Health Care Institute’s Department of Population Medicine, a collaboration between Harvard Pilgrim Health Care and Harvard Medical School. I don’t know of any other insurance company that does that. When did Harvard Pilgrim first consider covering services outside of conventional care? We started covering therapies that are typically used as part of an integrative approach about four years ago. We cover naturopathic care, we cover chiropractic, and we cover acupuncture. There’s a whole list of things. There were a variety of factors that led us to feel that it was the right thing to do. One of those factors was that we are sensitive to the fact that we have a very diverse membership. There’s an expectation that we'll honor our members preferred healthcare options as part of their health care package. What challenges did you face in providing coverage for non-conventional health care services? One of the first things we do when setting up coverage is to research safety. What is the evidence behind this particular therapy? Is there any literature? The hardest part when researching integrative medicine is that these studies are not easy to fund, and there is often not a lot of money to put toward them. After that, the biggest thing was setting up a network. Not many people in the non-conventional realm have been included in many insurance payer groups traditionally, so we had to learn who was out there, who offered what, who worked where. And, fortunately, we have had a very great group of naturopaths who came in and really educated us about what did they cover, what was the scope of their practice, what kind of training they have, and really reassured us and let us know what we were saying yes to. Jaclyn Chasse was one of those Naturopaths. What kind of misconceptions did she, and other naturopaths help you overcome? I’m not sure that we had misconceptions as much as it was them clarifying for us what they were all about. She was clear about the very thorough, very strict training they get, what they prescribe, and their scope of practice. Me, being an allopath, I understand that I am not going to be doing heart surgery on someone. I am not a surgeon. And so I said “Are you taking care of people that would be sick enough to be in a hospital?” And she said “At this point, no.” She was very clear that their training at a minimum was more than adequate to take care of the kinds of outpatient care that people had. She also reassured me that she wasn't against allopathic medicine. It was very clear that she was able to integrate into allopathic care and to refer people when she felt there was a need to refer them on to somebody else. It made me comfortable that there were limitations on what they were supposed to be seeing in a way that made sense and was helpful in reassuring that our members could count on getting quality and safe care. Can you describe the process it took to get other health care services covered under your insurance policies? Typically one of the ways the process starts is when we get a request from somebody, whether it is an employer group or a member. That request, if it has to do with medical care, usually goes to a policy team within the organization. From there, first and foremost, we research the safety of the therapy as I mentioned earlier. If we find studies that prove that this therapy is safe, we start to look at how many members would use the approach. For example, if we have 1% of our population using a particular therapy and it raises our rates by 100% that is not going to work. We look at what the proposed idea is going to cost, and if it is reasonable for the return on investment? This isn’t just about the cost, but what does it save in terms of ill health? Will more people be able to be at work and be healthy? Will they be able to avoid the emergency room? Will they be able to avoid pain prescriptions that cost thousands and thousands of dollars a year? We know that we are basically spending somebody's money; we don't print money at the insurance company. When we pay for medical services, we are spending premiums – your money, your employer’s money, or a government subsidy from the individual exchange. It might be all your money, so we want to make sure we are spending somebody else's money on something that works. If we can make a business case then there is a fair amount of work to actually go out and find out, ‘Who are the people in our network that provide that service,' and go out and meet with those providers, send them fee schedules, and discuss contracts to include something we’ve never done before. The process is all new, it's not something you can pull off a shelf. We figure out all those kinds of things, such as identifying the appropriate code (mandated by federal and state law), and re-configuring our information systems to pay the code. And then we model more specifically the nuts and bolts of making it work. Including, we ask if the service is inclusive so that everybody can have it available. After that, we follow up to see how the approach is doing. If we get complaints about it then we certainly have to investigate those. We always first and foremost look out for patient safety. Very briefly, that's kind of the procedure. It pretty much involves every department when we come up with a new idea. As a not-for-profit we will often offer a new therapy, even knowing that there is no profit to be made, if we can even come close to breaking even on it and it is going to provide something to our membership that makes them have access to care that they are used to getting. That's how not-for-profits in general work. We try to do things that don't always have a profit center. Where do you see integrative medicine aligning with the healthcare industry into the future? I really think that all of us have illnesses that don't necessarily need a scalpel or a high powered medication. Some of these things are not going to kill us, but they certainly affect the quality of our life. For a large percentage of people there are options that practitioners, such as naturopaths, offer that would be just as good as traditional medicine without some of the risks. If we could get people beyond the expectation that if we are not giving out a prescription and we are referring them to an acupuncturist, a naturopath, a chiropractor or someone else, it is not because we don't care about their problem but that we think it is a very legitimate option for care. How have your customers responded to this coverage? I believe we’ve built a great reputation for being responsive, for being innovative. Understanding that there is more than one way of doing things really helps for us to be very inclusive and diverse. At this point, there is a small enough network of providers that this coverage is still not mainstream. But even for people that don’t use this model of care, they like to know that we are open minded, and flexible. We try not to just follow. We really try to think about where we ought to be ahead of the curve. What would you say to patients who might be reading this who are frustrated with the lack of integrative coverage where they live? Is there anything they can do? Yes, there is. I would assume that with every single plan, that there are caring physicians, caring employees, caring leadership that are out there. Start a conversation. It is amazing the response people can get if they write a letter in a thoughtful 'Can I meet with someone to talk about this?' way. While it might not happen right away, I have seen in this company it gives us something to start to think about as 'You know what, we could do this. 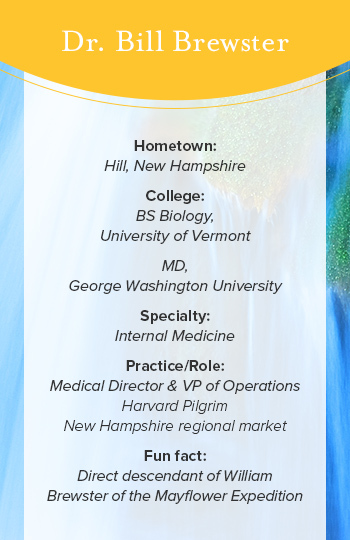 Learn more about the pivotal role Dr. Jaclyn Chasse played in New Hampshire and hear her thoughts on breaking insurance barriers to integrative care.